The Governor's "house" (complex) was a large Creole-style, poteau-en-terre (post in the ground) structure. The half-timbered structure had in-filled walls made of bousillage—a mixture of mud and Spanish moss or grass or animal hair. The Govenor's house had a four-shed roof with a gallery sheltering the mud walls. The Urrutia map clearly shows this dominant structure. Urrutia's profile shows a large exterior bake oven built onto the gallery (shown above on left). The structure was virtually identical to structures built by the neighboring French with the exception of the lack of interior fireplaces and typical central chimneys. None of the structures at Los Adaes had brick fireplaces or chimneys. The Spanish apparently used charcoal braziers instead. The outdoor oven attached to the structure is more typically found in northern Mexico. In French construction, bake ovens for bread were built in separate spaces under small sheds. While corn-based foods, such as tortillas cooked on comales or griddles, were the norm at Los Adaes, wheat bread may have been considered a higher status food by Spanish governors. Excavations uncovered parts of the fallen building and sections of an in situ foundation in the vicinity of the oven. Wrought iron pintles in the beams suggested that there were shutters and interior areas where things were hung. Small areas of discolored clay and postmolds marked the walls of the house, some of which had been destroyed by a modern access road across the site. An associated well immediately at the west edge of the structure was left unexcavated. The 1720 architect’s plan for the presidio describes the structure as the Vivienda de Comandante y Almacenes—Commander’s Residence and Warehouse. Soldiers were paid in goods and the Governor had control over the acquisition and distribution of goods. The governors set the price of goods, and therefore were in a position to make a profit at the expense of the soldiers. Artifacts recovered from the area of the governor’s house included mano (grinding stone) fragments, fragments of Asian porcelain, French faience, Mexican majolica, bottle glass, and American Indian pottery. 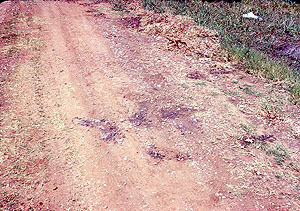 Sketch of structural evidence of the Governor's House that was exposed by road maintenance and mapped by Gregory in the mid-1960s. From Gregory 1973: Figure 9. The Spanish Governor's house exposed in parish maintenance road in 1970. The white fragments are pieces of lime plaster, suggesting that at one time the Govenor's house had plastered walls, one of many indications that this was the most elaborate and well- maintained structure at Los Adaes. Another view of the Spanish Govenor's house exposed in parish maintenance road in 1970. 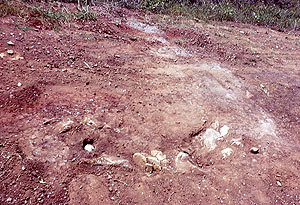 Note the sandstone rocks, some of the only large rocks found at the site. 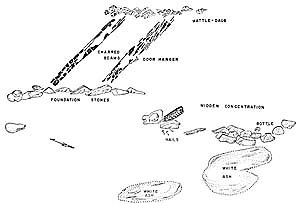 These are thought to be the foundation for an attached bake oven, which is shown on Urrutia's profile drawing. Such ovens were common in French colonial sites and do occur in Mexico. While the corn-based foods, such as tortillas cooked on comales or griddles, were the norm at Los Adaes, wheat bread may have been considered a higher status food by Spanish governors.